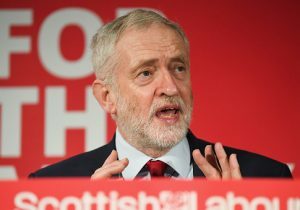 A Holocaust Memorial Day statement released by U.K. Labour Party leader Jeremy Corbyn made no reference to the approximately six million Jewish victims of the genocide. "We should never forget the Holocaust: The millions who died, the millions displaced and cruel hurt their descendants have suffered," Corbyn wrote on his Facebook page. "We should understand the way fascism arose in Germany and the circumstances that gave space for the Nazis to grow," he continued. Under Corbyn's leadership, the Labour Party has been subject to a series of embarrassing scandals over anti-Semitism within its ranks. Corbyn himself has been criticized for past support of the terrorist organizations Hamas and Hezbollah. In 2016, Labour set up the Chakrabarti Inquiry to address the problem, which led to the suspension of high-profile members Naz Shah and Ken Livingstone for comments comparing Israelis to Hitler and claiming the Nazi leader was a Zionist. Corbyn's omission comes after U.S. President Donald Trump faced similar criticism in 2017 for a statement that broadly referenced "victims," but did not mention Jews. Previous statements from Presidents Barack Obama and George W. Bush did directly mention the Jewish victims.